I am sure you have heard it time and time again, I know I have, “be sure to stretch”. But why is it so important? 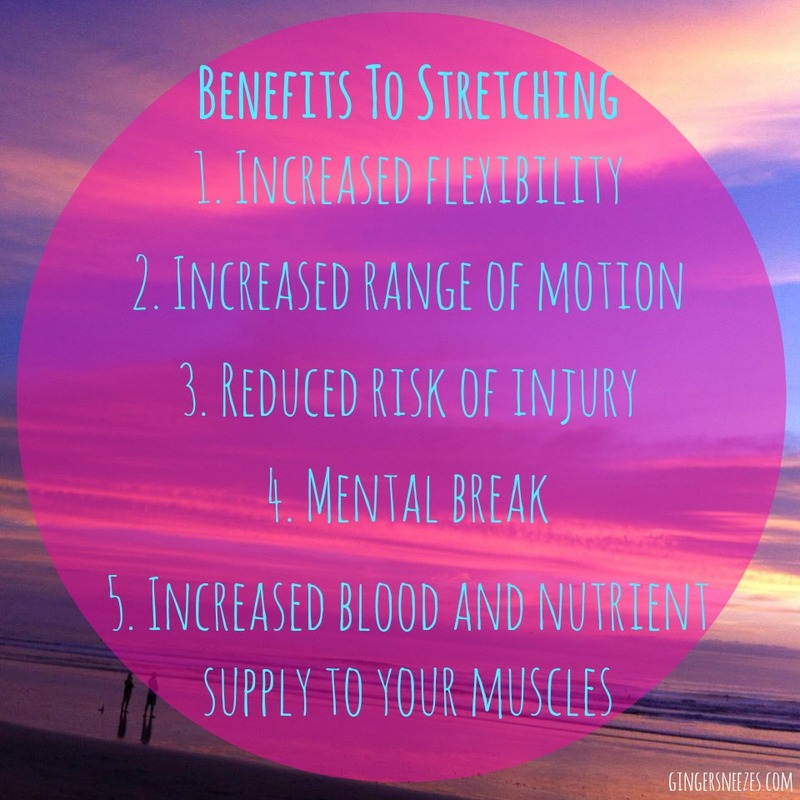 What is it that stretching does for us that is so important? and is it really that big of a deal if I don’t stretch like everyone is telling me to? Well in short yes. Stretching is super important, and this isn’t the yoga teacher in me coming at you with this throw down of truth. It is the injury prone body of someone that loves to move pleading you to stretch. Besides the fact that as we age our mobility is restricted by our flexibility more and more, and increased flexibility will leave you less prone to chronic injury, falling and other things that would be awful for our poor aging bodies, there are some right now benefits to stretching we should all know about and be excited for. The effects of not stretching aren’t going to happen over night, however there is always that possibility. If you don’t stretch after going from the gym, upping your cardio, increasing your weights and getting totally ripped you will be fine for a while. Then it will happen, what I call the “tightness” will set in and it won’t be pleasant. Maybe you are thinking “I go to yoga once a week” or “only guys don’t stretch because all the care about is muscle mass” well unfortunately this isn’t the case for either of these statements. Firstly, I know a ton of guys who stretch their faces off, who attend regular yoga classes and who are all around concerned about their physical fitness. Secondly, one yoga class a week is a great start but with all the sitting, walking, running, weight training, and movement our human bodies do a single day of stretching just won’t cut it. Yoga once a week is kind of like eating nothing but pizza all week and then sitting down with a salad every Friday to lose weight, things probably won’t balance out. Before we get into all the wonderful benefits to stretching let’s address what I would consider the number one peril of not stretching which is lack of mobility. Lack of mobility is basically the worst thing ever (well maybe not ever but it is pretty awful) and not only for the athletically inclined. Having a limited range of movement affects your every day life from playing with your kids to walking the dog, shoveling, watching TV or lacing up your shoes. Being limited in the way that you can move and live your life is a serious restriction and unfortunately it is not like a fine wine, it does not get better with age. What is lack of mobility? It is a wide range of things (hence it being the #1 peril) it be anything from not being able to touch your toes, struggling to lift your arms above your head, rotational movement without pain, achy knees, a sore back, and the list could literally go on for days. Who would want to be a part of any of this right? Enter stretching. What is so great about stretching? I mean besides it helping you to avoid all the awful things I just mentioned there is a plethora of positive benefits, one of my favorites is it’s calming effects on the mind. Sure while you’re doing some foam rolling you don’t feel so calm and centered but think back to when you did a neck stretch or stretched out your back to relieve a pinch, that felt pretty good didn’t it? and I be you felt pretty mellow after you released the stretch maybe even a little satisfied perhaps. So why wouldn’t you want this feeling all the time? Stretching can also help you to avoid or lesson that muscle soreness most of us feel after a heavy weight day, a long run or a challenging swim. Stretching encourages blood flow and sends some much needed nutrients to your hard working muscles to help them repair after a hard day’s work, just like you need to fuel after a workout your muscles do too. So feed your muscles with some stretching. While stretching is giving you a mental break, feeding your muscles and increasing your range of motion, it is also helping you become more flexible. Just like you can’t get strong without working at it most of us can’t wake up and just be flexible it is something you have to work at. I am not saying we should all be able to wrap our legs around our shoulders and look like pretzels, but I do believe that we should all be able to effortlessly touch our toes, lift our arms above our heads, and take our bras off without spinning the clasp to the front. All of these things might seem silly and meaningless when you are in your teens, 20s, 30s, and probably 40s but as we age our flexibility naturally decreases so getting a head start on exercising our flexibility in our teens, 20s and 30s will only benefit us in the long run. Now that you are all super excited to go out and buy a foam roller and start stretching for 15-30minutes a day I will quickly touch on what I think is important in the world of stretching. I don’t stretch before I workout, I warm up. You don’t want to go into a stretch with stone cold muscles, much like you don’t want to start a workout without warming up. Before a workout I will use dynamic stretching and once my workout is complete I will use static stretches because my muscles are heated and ready to stretch. When stretching I focus on the muscles I used that day, i.e. leg day I stretch my legs, back day I focus on my back, etc..
YOGA! I know some of you might be thinking yoga is for hippies and people who don’t wear deodorant (honestly that was my opinion when I first tried it and now I am a yoga teacher) but that’s just not true. There are so many different types, styles, and paces of yoga I am positive you can find something that will feel good for you and fit into your life. I try to go three or more times a week, but if you are just starting try it out once a week I am sure you will fall in love. Don’t look for pain. 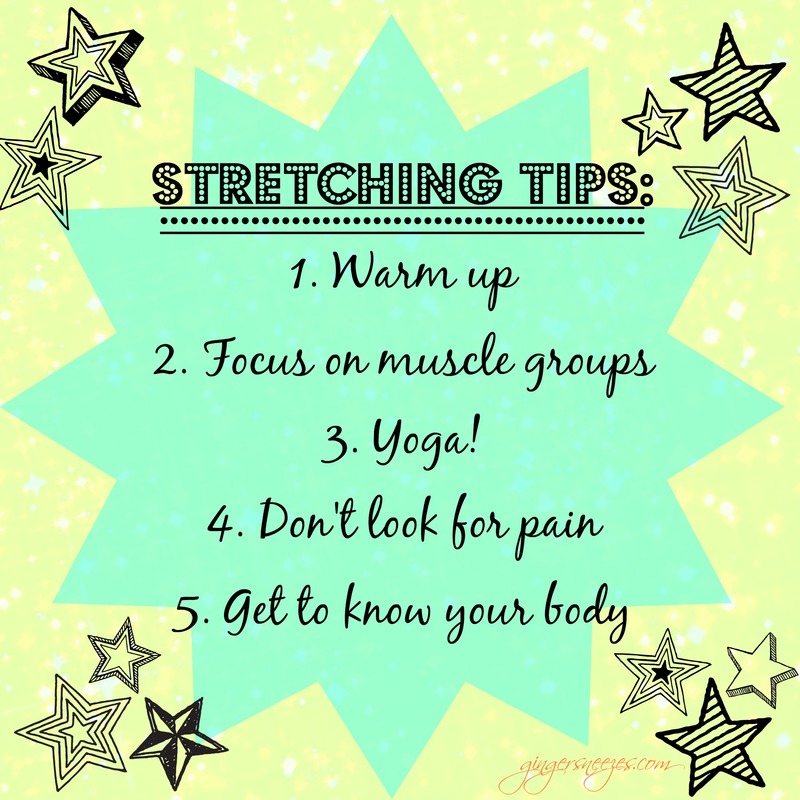 Sometimes stretching can get intense and down right uncomfortable (especially if it has been a while) but you shouldn’t be in pain. If it is burning or you are about to burst out into tears back off, you want to stretch not rip your muscles. Get to know your body. If you have some type of chronic injury (ex: bad knees) don’t go full force into something that might agitate your injury and if you are ever unsure of what to do approach a professional. Personal trainers, physio therapists, massage therapists, doctors and chiropractors are great sources of information and will likely have some pointers on how to keep you safe. Now that you have learnt all about stretching see how you can plan it into your regular workout routine. Or feel free to share how you have managed to work it into your health and fitness plan. This entry was posted in General and tagged benefits, blood flow, fitness, flexibility, health, range of motion, strength, stretching, yoga by healingginger. Bookmark the permalink.